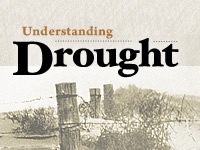 Understanding Drought--This webcast provides an introduction to drought. It presents the measures and scales of drought and how drought is monitored. It also covers how drought is predicted, the impacts of drought, and provides information about drought-related resources. This content serves as a foundation to learning more about climate variability and operational climate services and prepares users for the national implementation of NIDIS. This module was last updated on Sept 28, 2009. Very useful and interesting. Very efficient way to learn! Awesome resources available specific to the analysis of drought using varying factors individually and collectively! It's informative, easy to understand and short. The questions here are mind provoking and highly informative. Would recommend this to anybody who wants to have an intensive knowledge. The tutorial provided a good understanding of the subject matter, the online quiz was a new experience. This course is very interesting and helpful. It gives me more information. It really is a mind blowing quiz. I would like to see a real case study about how socio-economic factors and drought information worked together to mitigate impact severity in the short term and longer term. This is so user friendly, easy and convenient way of learning. this was a very interesting topic to read and the slides prepared where easy to navigate. Short, factual and to the point. this is on the job training, as well as on the job training, and company expansion, for "THE EMERALDS FINEST/ BAER TEAM-3 ORGANIC PRODUCES, EMERGENCY RESPONSE ALL HAZARDS. When to give us a relative issue about understanding floods? A very informative and precise presentation if you want to understand about drought. I really enjoyed the mode of presentation, it keeps you focused to the end. This was a very informtive module. I recommend it to anyone wanting to learn more about drought or weather. It was very easy to understand, but also gave you enough facts to help you learn something more. It was very good. This is really helpful. the content is precise and interesting, and the graphics are illuminating.